To be honest I was not planning on doing a Christmas gift guide as cleaning and organising products are not something that most people would think to give for Christmas presents. However there are a lot of people out there that are starting to think about their environmental foot print and how they can reduce their waste. So I thought that Christmas time is actually the perfect time to encourage this by giving gifts that may start someone on that reduce waste journey. I have identified 5 kits for the home that you can actually easily make and give as awesome gifts for Christmas. Scrubber - fill the small jar with baking soda and for extra special treat put a few drops of an essential oil and mix through. Then just label “Scrubber”. Get your free guide on how to make your own all natural cleaning kit. The great thing with the Kitchen kits are that they are not only pretty kitchen accessories, they are also functional and totally reusable. To make these kits you just need some dispensers and buy or make the cotton dish cloths. Don’t forget to check out Etsy which has a great selection of cotton dish cloths. For the dispensers you could just recycle some empty ones that you have around the home. I do have a preference for glass as they do last a lot longer, are easier to clean and good for recycling. There are a few places that stock refillable glass dispensers. I have recently come across this great online store , Packageless Pad that stocks a great selection of glass containers and these Classic Syrup bottles are perfect for using around the home. To add a bit of home decor it’s nice to place them on a tray and maybe add in a plant, so you could add these into your kit to jazz it up a bit. Lastly don’t forget to fill the dispensers with the soap, for the hands and the dishes. Ideally use a product that is chemical free and obtained from a refillery and or a eco-friendly product like Eco Store from the supermarket. For the Laundry kit I just got a selection of jars that you can easily label Laundry powder and Soaker. You could also add in some wooden clothes pegs. Most of these items you can get at a supermarket or find around the home. I sourced my jars at the time from The Warehouse, there is still a good selection. The refillery GoodFor also has a good selection too . Also you could try Figgy & Co as you can get both the jars and laundry product. In fact they have The Laundry Pack which you can purchase. My laundry set up is below where I have the laundry powder, soaker and I have baking soda and a bottle of vinegar. Hint a wee mix of soda and vinegar in the wash, especially for towels helps fluff them up. One of the exciting things that I came across this year was recyclable toothbrushes and organic toothpaste. As well as better options for dental floss and cotton buds. Eco store has introduced a range which is available from most supermarkets or online. Go Bamboo is also worth checking out too as they have the cotton buds. Something else to think about for the bathroom kit is a sample pack for Hair and Face products that don’t come in plastic bottles. The fabulous products from Ethique would make a wonderful present. Oh and please check out Soaps by Roi a fabulous Kiwi making beautiful products based on Rongoa Maori (Maori medicine). Once again with the other kits you could put them into storage jars and gift them all set up. Example below is a Bathroom kit. Who loves walking into those lovely home stores with those gorgeous scents floating around the air, how lovely would it be to give a gift that can make someones home smell like that. All you need is some jute bags, cotton balls and essential oils and scented candles. The jute/hessian bags or cotton bags, I source from Spotlight of all places and the cotton balls can be sourced from the supermarket. For essential oils I source mine from doTERRA and an awesome place in Akaroa, NZ called Fire and Ice. Just place a drop of oil on each cotton ball and pop them into the bag and hang them in places around the home. I use mine in the wardrobes, linen closet, kitchen and bedrooms. Scented candles are the best, but make sure you get quality candles and ones made with Soy. I have been fortunate to have a lovely lady at work who makes the most wonderful soy candles. Also check out Soy Delights Nz as you can purchase from her Etsy store as well. So there you have it 5 Christmas gift kit ideas, which are easy to put together, budget friendly, reusable and produce very little waste and encourage more people to reduce their environmental foot print. Have a wonderful Christmas my dears, and enjoy your gift giving. Have I told you how much I am in love with my newly renovated master bath/ensuite and guest bathroom! Pete and I love the simple design and understated style. I love how easy it is to keep sparkling clean and looking new. In fact, the ease of cleaning and maintenance was an important feature in the design. As a paid cleaner, in my younger days and cleaning up behind my kids I know what a real pain it is to clean bathrooms. 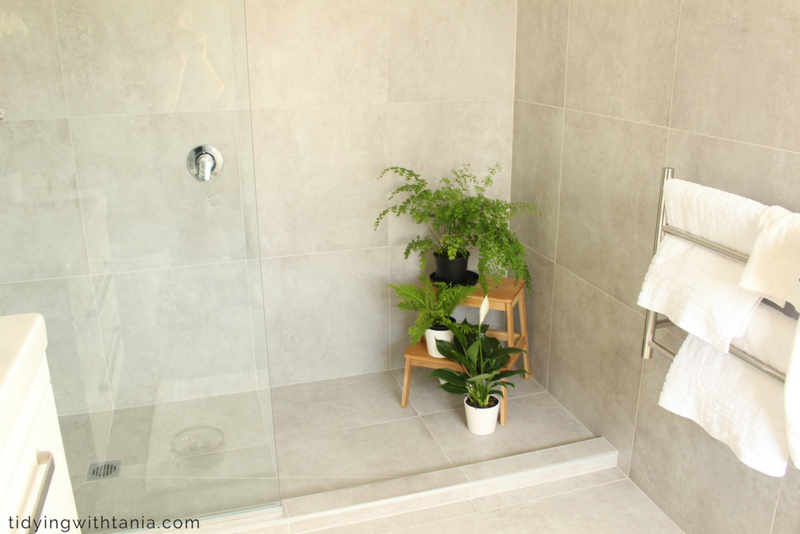 Both showers in the master bath/ensuite and guest bathroom are the same in design. Our master bath/ensuite is what is referred to as wall to wall. In other words the shower runs along the full width of the end of the bathroom, having one wall as the shower end and the other wall as the end of the shower. The side of the shower is one piece of glass which is just over a metre long. It gives the shower a nice open feeling while containing the water. It is a very simple design and best of all there is no doors and therefore no joins and metal parts which can get grimy and caked in soap scum and difficult to clean. The biggest battle with keeping a tile and glass shower clean is the build up of soap scum on the glass and in the grout of the tiles. Also depending on the colour and texture of your tiles, soap scum can easily show up on the tiles themselves, especially if you have dark tiles. I recall my gorgeous sis from helenryan eBoutique (shameless plug here, check out her bags... like OMG) renovated her bathroom and got black slate tiles in the shower and said "never again" . It was a complete nightmare to try and keep the film of soap scum from showing on the tiles. My mission was to work out how to ensue with the soap scum battle and win while using natural home made cleaners. 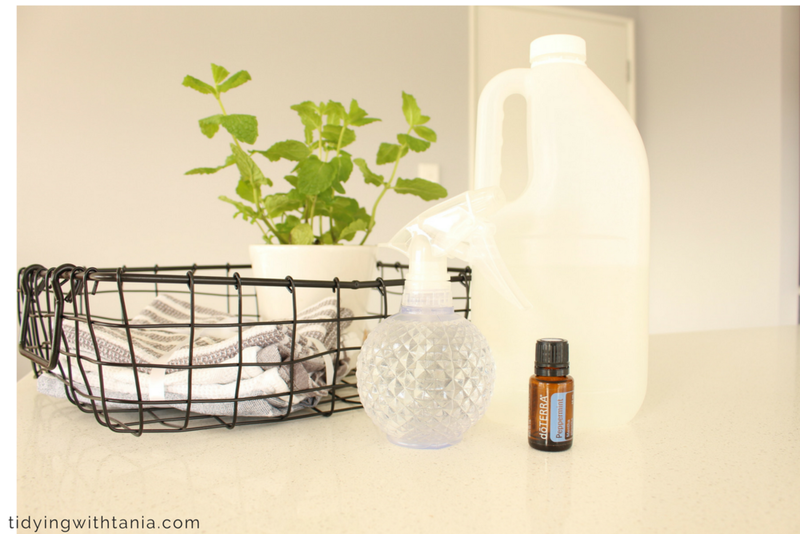 As my readers would know, for a few years now I have fully converted to home made natural cleaners and am loving them and totally impressed with how effective they are. 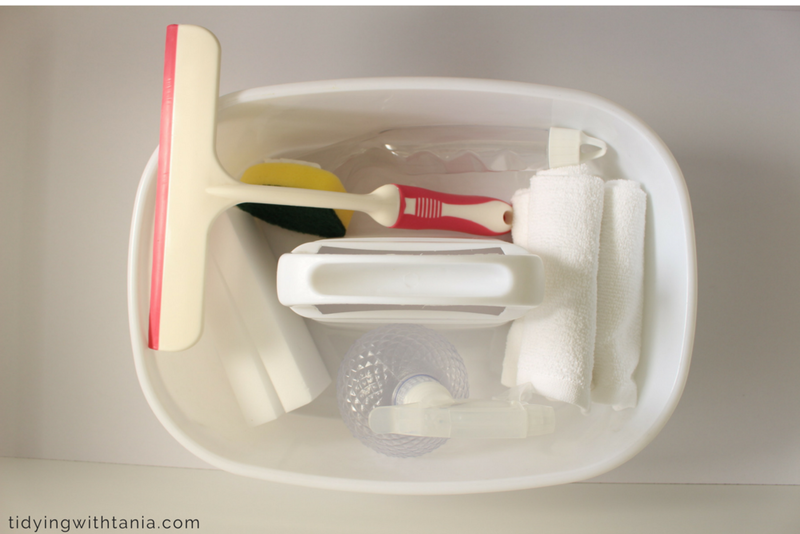 If you want to read about how I set up my cleaning kit check out my post here . So what is in my kit? My general cleaner - this is my all purpose general cleaner that I use pretty much for all cleaning in the home. Seriously how simple is that! I already keep a bottle in my kitchen, laundry and cleaning kit so I simply made up two more for the bathroom "kits" . This cleaner is what I use to clean the shower glass and shelves and the tap and shower faucets. A bit of dish liquid, I use Eco Store dish liquid , however am really keen to try Mrs Meyers dish soap as I have heard great things about it, especially the beautiful scent and they are earth friendly. The liquid is used to help clean the tiles and grout and I put it into the "scrubber"
You can pick up these products at your local supermarket or just get them online. The spray bottles have been a challenge to find. I originally found some in the Japanese $2 dollar store, however I have not been able to find them again. Even better are these glass bottles which I will be getting to replace the plastic ones. Now just to clarify, I do this when I have my daily shower. Cleaning the shower is sooooo much easier when you are actually having a shower!!! That's my one tip of the day. I have got the daily shower cleaning routine down to three steps and a total of 1-2mins...5mins maybe max which I do at the end of my shower. Not you! the shower! 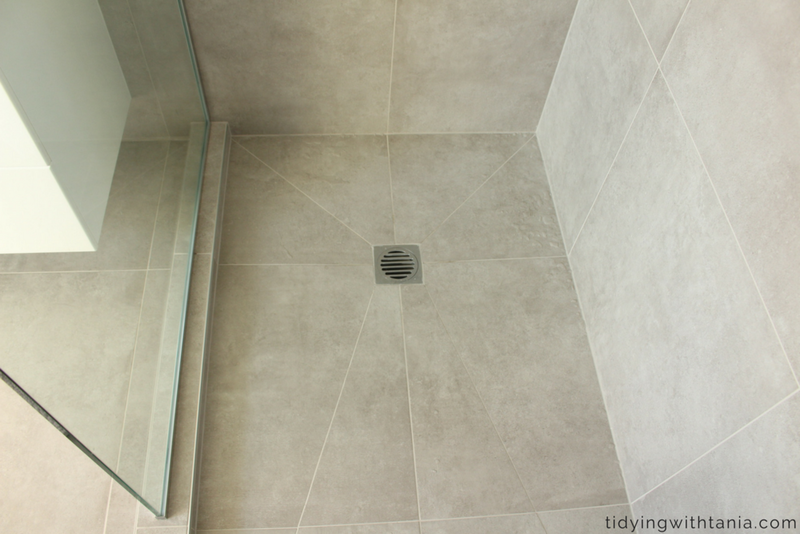 Take the scrubber (with the dish liquid) and simply scrub around the high use area of the tiles. This would be around the bottom third of the wall tiles under the shower facet and the side wall as well as the tile floor area around the drain and where you stand. Make sure that you give the tiles a good once over and ensure that you scrub into the grout. This does not need to be a full on scrub fest, remember you do this daily so it only needs to be a quick once over to stop the soap build up. The just take the shower head and rinse! Take the general cleaner and spray the glass, and faucets. Then wait....do not rush in and wipe off. The secret to vinegar and water cleaner is to wait to allow the cleaner, to what I call "stew" , this ensures that it activates with the surface to lossen the dirt. I take the sponge and go over the glass and faucets to ensure the "scum" is actually moved off the surface. If you just use a squeegee you will not move the scum off the surface, you just take the water off. Then I get the squeegee and wipe down the glass. I also use the squeegee to move any excess water off the tiles into the drain. Step out of your shower and enjoy the view of a beautiful clean shower!!! As I said this should only take you a max of 5mins, if that! And you are done. I have found by doing this each time I have a shower there is no need for me to do any other "shower cleaning" so no more weekly big scrubbing jobs. I have actually freed up a lot of my weekly cleaning routine by doing this...bonus! Just a note to ensure that you do replace the sponges when they get a bit old and dirty, atleast once a month. Check out the Scotch-Brite one as it comes with replacement heads. I have set up a similar shower cleaning kit for the guest bathroom. The main difference is that I only use this when we have a guest using the bathroom. So when we do have a guest I just do the same 3 steps as above. Of course I wait until the guest has left the bathroom! The only difference is that I use cloths instead of the sponge and place these in the wash after each use. This is because I keep the cleaning kit in the cabinet as I don't want my guest to see the kit and I don't want a wet sponge sitting in the kit in the cabinet. To be honest I really hate seeing cleaning stuff out in the shower area, however as I need to access the kit daily in our master bath/ensuite, it really does need to be in the shower. However I figured a way to disguise it, or rather make it less obvious. 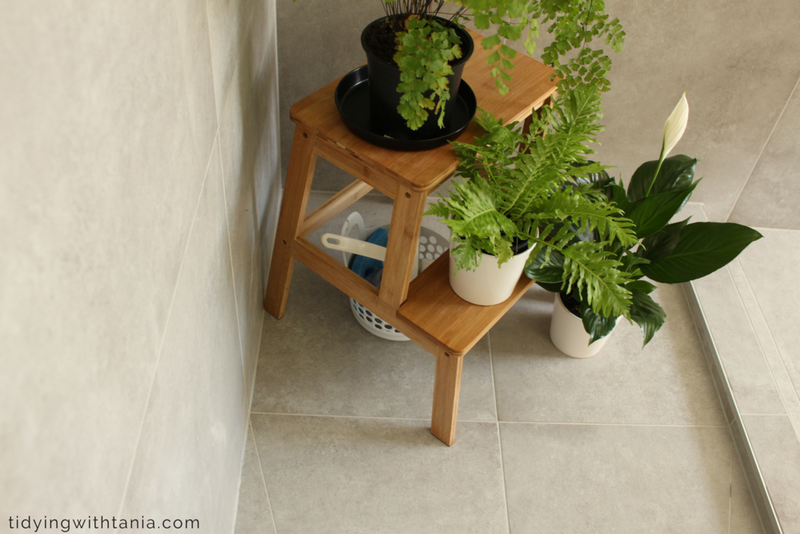 Thanks to the room we have in the shower I have placed a stool at the end with a couple of pot plants, which was in part how I wanted to style the ensuite anyway. It just so happened that I could put the "kit" in underneath the back of the stool so it's tucked nicely out of view but easy to access at the same time. There you have it, my 3 step daily shower cleaning routine with hame made natural cleaners all done in under 5 mins. I will be bringing you an update on the kitchen cleaning, as with the bathrooms, it is newly renovated and I have set up a new cleaning routine as well. I hope you found this post useful in some way. Let me know what you think and if you have any cleaning hacks...always keen on those. 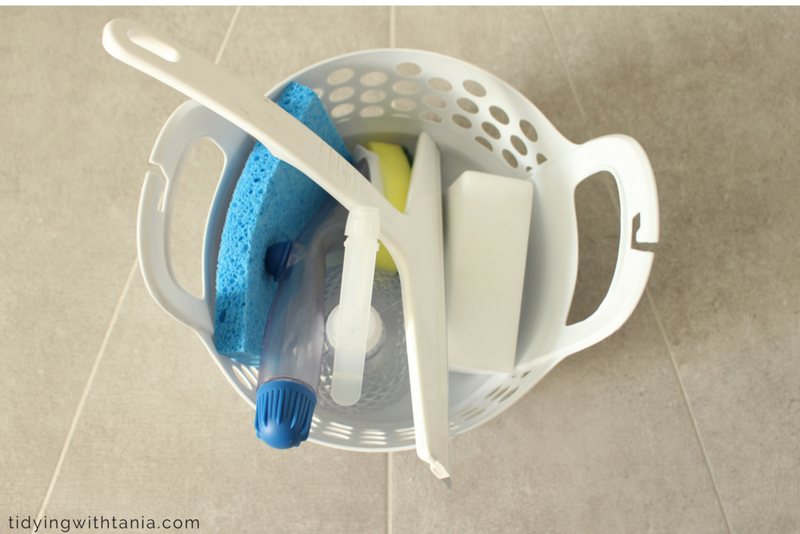 Here is a FREE cheat sheet with the details on how to make and use these cleaners which you can keep and have on hand...no excuse now not to be cleaning! Success! Nearly there! just check your email to confirm subscription and get your free Cheat sheet. It's so cool all the little tricks you can learn that can make such a difference to how things look ! Tidying with Tania is all about helping busy women to keep the clutter away. As an expert organiser Tania provides simple techniques in organizing and planning to control the clutter, so you can relax guilt free! .............welcome to Tidying with Tania. I am an empty nester and midlifer who happens to be a decluttering and organising expert. I love sharing my experiences, ideas and tips for repurposing spaces and rooms, renovating and decorating, simplifying, decluttering and organising for your home, garden and life. A free guide just for you, to help you have an organised life and clutter free home. I love it when you share! Please keep in mind that all images and texts on this site are the property of Tidying with Tania. Feel free to use one or two photos, provided that a link back to my original post is included. Please do not remove any watermarks, crop or edit any of my images without first obtaining written permission from me. All free printables offered are for personal use only. Pinning is always welcome and appreciated! Thank you.